Revised and updated for the first time in a decade, this book discusses packaging implications for recent nonthermal processing technologies and mild food preservation such as high pressure processing, irradiation, pulsed electric fields, microwave sterilization, and other hurdle technologies. It reviews typical nonthermal processes, the characteristics of food products after nonthermal treatments, and packaging parameters to preserve the quality and enhance the safety of the products. In addition, the critical role played by packaging materials during the development of a new nonthermal processed product, and how the package is used to make the product attractive to consumers, is discussed. 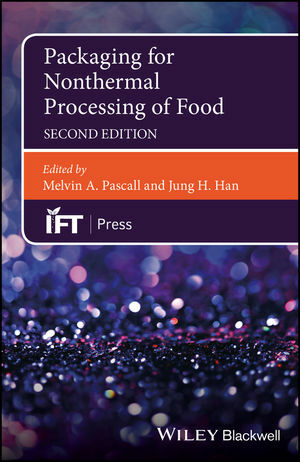 Packaging for Nonthermal Processing of Food, Second Edition provides up to date assessments of consumer attitudes to nonthermal processes and novel packaging (both in the U.S. and Europe). It offers a brand new chapter covering smart packaging, including thermal, microbial, chemical, and light sensing biosensors, radio frequency identification systems, and self-heating and cooling packaging. There is also a new chapter providing an overview of packaging laws and regulations in the United States and Europe. Packaging for Nonthermal Processing of Food, Second Edition offers many benefits to the food industry by providing practical information on the relationship between new processes and packaging materials, to academia as a source of fundamental knowledge about packaging science, and to regulatory agencies as an avenue for acquiring a deeper understanding of the packaging requirements for new processes. Melvin A. Pascall, Ph.D., is a Professor at the Department of Food Science and Technology, Ohio State University, Columbus, OH, USA. Jung H. Han, Ph.D., is Adjunct Associate Professor, Department of Food Science and Human Nutrition, University of Illinois at Urbana/Champaign, Urbana, IL, and Vice-President of R&D, Pulmuone Foods USA, Fullerton, CA, USA.